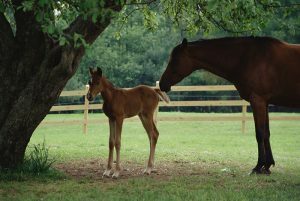 COLUMBIA — Two cases of eastern equine encephalitis (EEE) were confirmed in two South Carolina horses in June, according to Boyd Parr, state veterinarian and director of Clemson University Livestock Poultry Health. A 10-year-old horse from Horry County and a 4-month-old horse from Marion County recently tested positive for the disease. EEE is a serious, mosquito-borne illness in horses, which can also affect humans. EEE is preventable by vaccinating horses. Horse owners are urged to consult with their veterinarian to be sure vaccinations against both EEE and Western Nile Virus are up-to-date. According to the Centers for Disease Control and Prevention, eastern equine encephalitis is a rare illness in humans. Most persons infected with it have no apparent illness. Severe cases begin with the sudden onset of headache, high fever, chills and vomiting. People who are concerned should contact their physicians. In horses, symptoms usually develop from two to five days after exposure and include stumbling, circling, head pressing, depression or apprehension, weakness of legs, partial paralysis, the inability to stand, muscle twitching or death. Nine out of every 10 horses infected with EEE virus die from the disease. Any livestock, including horses, that display stumbling, circling, head pressing, depression or apprehension must be reported to the state veterinarian at 803-788-2260 within 48 hours, according to state law.